Thursday was unique in the Chronicles of Jean. I got a call from the facilitator of my old book club, the one I belonged to before my husband died. Things were crazy around that time and I had to drop out and by the time I could concentrate on reading again they didn’t have an opening. 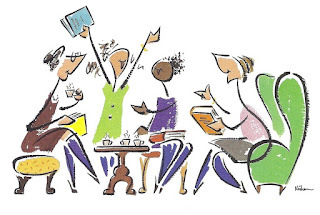 The book clubs around here use the Book-Club-in-Bag program through the libraries to borrow books so they are limited in size to twelve members. Fast forward a couple of years with my name on a waiting list to get back into the club the senior hall, who sponsors the club, had enough people on that list to start a second group which I joined a year ago and I’ve have had a love/hate relationship with it ever since. Then came the call. My old group invited me back in because they had an opening and didn’t want to take an unknown person off the wait list if I’d be interested in switching clubs. I liked these ladies because I could say anything about a book and they didn’t look at me like I had two heads. So I made the call to the senior hall director to get her “permission” to switch clubs which would make an opening for her to fill with my departure in Group Two. She was worried the members of the second group “would get their feelings hurt” so her only requirement was that I go in and explain my decision to switch groups. Get their feelings hurt? That never even occurred to me. That comment got me to wondering if I drift through life obliviously making selfish choices that unintentionally hurt the feelings of others. I guess I can see why Group Two could view my move as me favoring another group of ladies over them because…well, that’s exactly what I’m doing. Oops! The two groups meet on the same day and time and so Thursday I tried to contain my excitement as I dropped off last month’s book with Group Two and said my goodbyes, then I went across the hall to go to a lecture on downsizing. And near the end of the hour I went back across the hall to the room where Group One was breaking up to pick up their book for next month’s discussion. Yay! The Lecture: This was the second “downsizing” lecture I’ve been to at the senior hall. The first one was a few years go and I hated it. So why go again? I thought maybe I wasn’t in the right mood back then and that I was too closed-minded to what she had to say. To me, her only message seemed to be, “Donate, donate, donate, throw it out and don't look back.” Donate things like my husband’s Yellow Dog, the two headed pot, when I knew I could and did sell it for over $350 for it? This time I was hoping to find resources to help with downsizing---lists of tag sale services, auction houses, consignment shops---and not just a list of places to donate your life in cardboard boxes. God, I miss having a Yellow Pages book! Life was simpler when you knew a business was established long enough ago to have a listing in print. That was then and the lecture this week was much different. It was titled, ‘Transitioning without Frustration’ and the class description was: “If it's downsizing to another home, moving to senior housing, or downsizing everything into a motor home, we will support you in making the transition as easy as possible.” What it turned out to be is a tag team of three female real estate agents who say they specialize in “encore services,” a marketing niche trolling for seniors. They will help you find a new place to live, help you get your house ready to sell connecting you with a hub of painters, cleaners, de-cluttering services, handymen, house stagers, movers, bankers, tag sale services and supposedly hold your hands as they walk you through the process from start to finish and all 7% of the sale of your home. Most realtors have these same kind of contacts to recommend and they charge the same 7% but these ladies claimed altruistic goals which reminded me of the time some little kids wanted to shovel my sidewalk for free because, "We just want to help old people." I like that term conflicting ideas for the future. I can understand you frustration with the previous lecture. Having said that, as someone who used to clean out estates and hoarder houses you need to decide what is more important, having things gone or maki g money on them. Sometimes those two desires will mesh. Most of the time they went. Personally, even on my income. I am a donate if my kids dont want it kind of gal. Even with the China. But then I am not a "keeper". The whole idea of moving or stay put is a giant conflict of emotions for me. But I decided that either way it makes sense to get back to selling and purging. I don't have a hoarder's house by any stretch of the imagination, but I have a big house. I've been donating things to the Salvation Army recently I wouldn't have done last year...seeing the dollar signs in my eyes. But collectibles worth under a certain amount aren't worth the trouble of e-Baying. So I'm bite the bullet and am donating more and more. I wish I wasn't a keeper, but being one is a core value I got from my parents and reinforced by my husband. It's part of who I am. P.S. No one wants good china anymore, can't give it away or sell it. Dishwashers and microwaves have changed all that not to mention the food network shows that plate everything on plane white dishes. Good for you for switching back to the old reading club. How did you explain it to Group 2? And how was your first experience back with Group 1? Same group of gals? And even after we downsized from the house to the condo, who knew four more people would be moving in. Kidults finally cleaned out most of their giant closet and I took many 30 gallon trash bags filled with clothes and shoes to Goodwill for them. At the end of this summer, I donated things I didn't wear! I want to have ONLY clothes that make me feel FABULOUS when I put them on. That's my goal. I just told the new group that I'd been in that group a lot of years and why I dropped out and that they asked me back. Since I have a couple of good friends still there, I said year. of the twelve, 8 are still original members. My first experience back with the old group won't happen until next month. I just picked up the book this time but everyone I saw in the parking lot who heard I was rejoining was happy about it. My closet purging will take place over the winter and I should have someone come help me. I'm terrible about letting go of clothing. 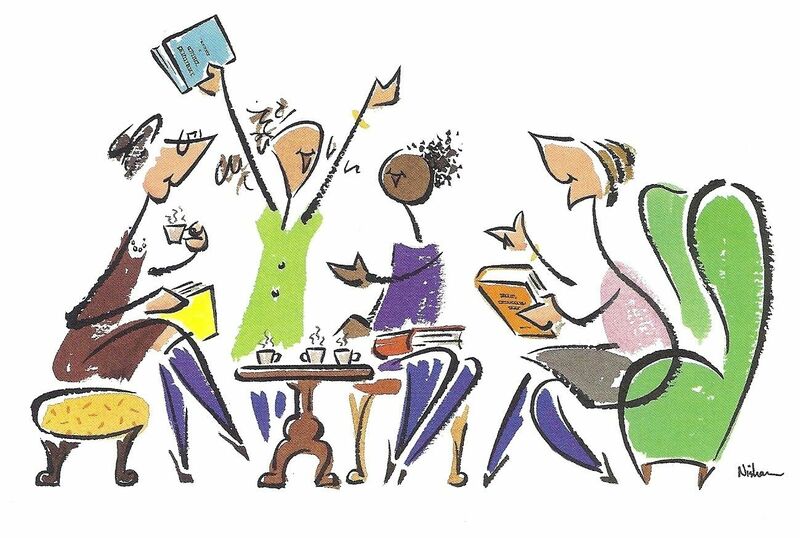 And I LOVE your book club clip art!!! Congratulations Jean now that you are back to your old group. Get their feelings hurt? What was she thinking? Those other ladies probably wouldn't give you any hoots. Would they think about you? Jump quickly back to your old group.Oh, I guess you did. Whoopee doo. Where have you always felt the happiest? Now that was a very interesting question. I'm going to sit back and think about that question and try to find what my answer would. Now you got me really thinking. See you my friend. I it any interest question to consider when thinking about moving. See I told you how great you are. Everyone just LOVES you Jean. 'Buongiorno mia amcia'. I am glad you got back to your old group and left the new one without hurt feelings. Life is too short to wear tight shoes and that second group just didn't fit. GET THEIR FEELINGS HURT?!? What is this? Middle School? LOL I'm glad you moved back to the old group; likely a better fit for you. It's been my experience when leaving a group that they get over it pretty quickly. Ha. The whole downsizing question is so complex, because it's such an emotional decision as well as a practical one. Does anyone ever address this aspect of it? Like you say, typically it's about getting rid of "stuff", but for me it's the emotional letting go of so many memories contained within a longtime family home that is the hardest to walk away from. The group I left will have a lot of changes starting next month. Another member announced her departure when I did and the facilitator is changing as well as the time they meet. People who've done it or are trying to mention the emotional side of downsizing but it sounds phony coming from the professionals. I hate it when I get a sense of being patronized by someone trying to sell you a service that involves selling your hour. Sometimes you have to just do what feels right for you and hope that people understand your reasons. The old saying "You can please some people some of the time but you can't please all of the people all of the time", is a good one. I am sure Group 2 will have no trouble finding another member. Sometimes a change is of benefit to everyone. I'm sure they did understand. I think the senior hall director was worried for nothing. As I wrote to Donna up above, the facilitator announced her coming departure just after I did so with two new members and a new person running things, a lot will change. There are always people on the waiting list. Information is the prized commodity today and everybody has an angle to sell what info they have — not give it away. I’m with you on missing phone books as sources to search for businesses I want to use. Internet searches are meager by comparison as I’ve found the group’s offering those services to be also — very incomplete. Those internet browsers have said their reason for gaining even more info about us, if we’ll just reveal it, so they can deliver what they determine are personalized services we will use and they decide who to refer us to based on many factors they’ve learned about us are inadequate. This is not my idea of what I want — being spoon fed what someone else (an algorhythm created by others, a computer or robot) decides is best for me. Deciding to change groups should have nothing to do with hurting other people’s feelings. Are these adults we’re talking about? Time they should grow up. Prople will have to think whatever they want to conjure in their minds whatever you do. You don’t need a reason to change, much less need to explain it to anyone, any more than you just want to do it. If you have to tell them something so as not to be offensive, it’s simply the group to which you first belonged and they finally had room for you again. I’ve sttended a couple of the downsizing sessions myself at different places. They are pretty much as you describe as the real purpose is to get you to apply for residency in the sponsoring facility. Or, engage the presenter for whatever service is their business, I.e. often real estate and/or other professional services to whom they refer you. Having hired them, they will then reveal to you what sources they think you might use which may or may not be inclusive of all for various reasons. I guess i sound jaded and maybe I am. Interesting you did come to a conclusion about your need for a creative room. That’s better than withdrawing and living in your head which can happen to some people. I hate those algorhythms that suggest what you need. I research a lot of things when I write that have nothing to do with me personally so I'm getting suggestions that just don't fit. It was only the ONE person---the senior hall director---who was worried someone's feelings could get hurt, so it's not correct to characterize the second book club members as "time they should grow up" or ask "are they adults?" I need to clear that up. I am jaded, too, about real estate people. I think they make money from all the people they recommend for various stuff and they suggest things that really don't need doing. We showed a house once to a reality agenda who wanted to do a total kitchen remodel before listing. Another agenda lied to us about getting an the earnest check to take the house off the market. Ended in a big mess with us taking him before the ethics board because the day of the closing...the supposed buyer didn't show up and no check to cover that situation. I'm glad you got back to your "tribe" in book club land, and without any drama resulting. And also glad to hear you are starting to think about priorities for your next move. I have found it helpful to list what I want and compare the options available to that list. Helps keep me focused when flooded with information and opportunities, and leads to a better outcome when faced with important decisions. I can drive myself crazy making lists and comparisons. But I agree it a great tool for decision making. It's all very nice to assume that adults are going to behave as adults, but there are often a great many who simply Do Not. Thanks to social media--I'm looking at you, facebook--the collective maturity of many adults has dropped drastically. It's far too easy to gossip and snipe and act like junior high study hall kids all over again. Which is why I am not on any social media. Re: transitioning without your old treasures. A friend in Canada told me about a place called Millionaire's Daughter, which is an online consignment that resells all sorts of those pieces that no one wants, like Oriental rugs, dining sets, etc. He runs an inn and buys things there that complement his century decor. Stuff is tremendous quality and cheap, cheap cheap. So there's how someone is creatively solving that problem. Trust me, everyone in both book clubs was very adult and supportive about the whole thing. But I know what you mean about social media making people less civil and our president is making being uncivil okay. There are places popping up all over online for selling stuff. The only reason I stick to e-Bay is because I've been selling there since their beginning and I understand the ropes, the scams and process. I'd like to try some of the online local sales. I'm studying it but the potential for getting robbed in a parking lot seems high. This will be an important move for you. You're a researcher by nature. I know you will check everything at least once and then once again before you leap. The "downsizing" part didn't cause as many stomach pains for me as it did for H. He could lean toward being a hoarder if he was married to my sister. She doesn't like to give up anything. I'm always trying to keep clutter and collections down to a roar. But H surprised me. He really threw himself into the downsizing part of the move more than I thought he would. I think it was because he was very motivated. Motivated to simplify and motivated to move on to this next phase. The funniest part is when I search everywhere for something, ask H if it's in the attic, and after looking in every cranny, I finally realize that I must have tossed it before the move. It happens less now, but it happened more frequently the first year or so after we moved. LOL I wish you luck, and I'm interested to hear your experiences in this next step. As for the book club. Hurt feelings? Oh, my gosh. Too funny. Group dynamics can make such a difference. Sometimes we fit better in one place than another. It's as simple as that. I was once in a book club in which everyone was religious except me. That was interesting. I had lunch with a woman today who told me all the pit falls of living in a condo and she told not to do it! Not sure what I want to do but either way it makes sense to keep on downsizing. I just talked to a woman in the club I'm leaving and she was telling me that two more (besides the two I knew about) are leaving due to their husband's getting ill. So their whole club will be infused with lots of new blood and we both agreed it was needed. Too few in that group took take part in any of the discussions.